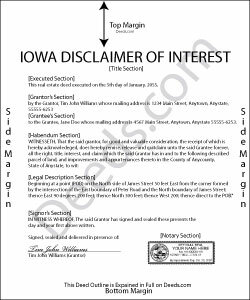 Under the Iowa Code, the beneficiary of an interest in property may renounce the gift, either in part or in full (Chapter 633E Uniform Disclaimer of Property Interest Act). Note that the option to disclaim is only available to beneficiaries who have not acted in any way to indicate acceptance or ownership of the interest. The disclaimer must be in writing and include a description of the interest, a declaration of intent to disclaim all or a defined portion of the interest, and be signed by the disclaimant (633E.5 (3)). Deliver the disclaimer within nine months of the transfer (e.g., the death of the creator of the interest) to the personal representative of the decedent's estate, or with the court that has the power to appoint such a person (633E.12 (3)). In the case of real property, record a copy of the disclaimer in the office of the county recorder in the county or counties where the real estate is located (633E.13 (a)). A disclaimer is irrevocable and binding for the disclaiming party and his or her creditors, so be sure to consult an attorney when in doubt about the drawbacks and benefits of disclaiming inherited property. If the disclaimed interest arises out of jointly-owned property, seek legal advice as well. Caville B. said: Received the documents, but the explanation and process is not as straightforward as I would have liked. The Instructions and Sample document were not always easy to follow. I may just have a real estate lawyer perform the task. Jack S. said: This is a great service and fairly priced. Reply from Staff: Thank you Jack. hope you're having a great day! Kelly L. said: So far so good. Please make the payment method easier after the information has been uploaded and submitted. Linda C. said: If I hadn't spent my career as an escrow officer (albeit in another state), I may have had a hard time figuring out exactly which deed I needed and how to prepare them, even with the back-up informational, how-to pdf documents, without an attorney. My experience speaks to how much the general public doesn't understand and how confusing it can be. Nonetheless, the access to so many documents at a fairly reasonable cost, the basic how-to docs made available along with the purchased doc makes all the difference. I appreciate having such things available to the public. Many thanks. Timothy P. said: Straightforward, easy to navigate, saves time and gas = a real value for the price!